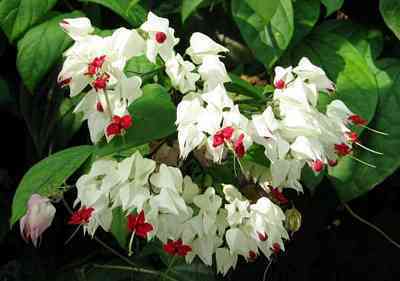 The Bleeding Heart vine, also known as Bleeding Glory Bower or Bag Flower, is a beautiful, twining, tropical plant with showy red and white flowers. 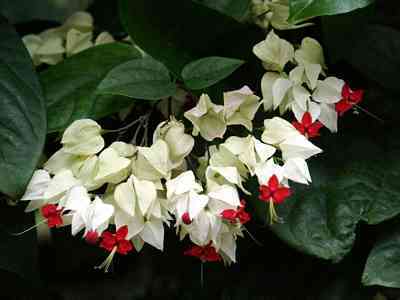 The Bleeding Heart vine (Clerodendrum thomsoniae), also known as Bleeding Glory Bower or Bag Flower, is a beautiful, twining, tropical plant with showy red and white flowers. It should not be confused with any members of the genus Dicentra, also commonly called “bleeding heart.” Bleeding Heart vine is a completely different plant. While the Dicentra members are mainly spring flowering plants native to North America and eastern Asia, the Bleeding heart vines are summer flowering and originates in the warm climates of West Africa. Bleeding Heart is a sprawling vine-like shrub that can be trimmed to just about any desirable size. 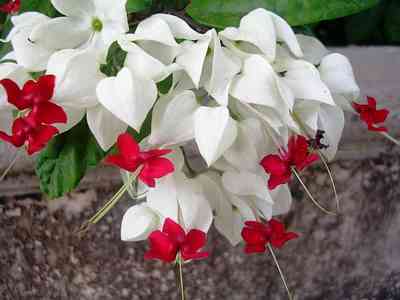 It produces tons of clusters of white heart-shaped flowers with a red, tear-like attachment at the base of the flower. Flowers are seen year round, but more during the warmer months of the year. 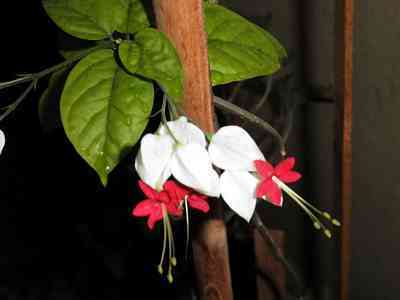 The Bleeding Heart vine is covered with large, evergreen leaves and climbs rapidly. The plant's stems can get 12-15 ft (4-5 m) long, climbing without tendrils, suckers or root hairs, but rather by twining through and around its support. You should provide a structure for it to climb on or keep it trimmed as a shrub. This is a tropical plant that will take some care to flourish. First thing to do is to choose a sheltered, sunny location to grow your Bleeding Heart vine - it needs heat and a lot of sunlight to reach its full potential. Best results occur with morning sun and afternoon shade. The soil will have to be high quality and have the ability to drain well. It should be loose and not packed. If planting in a pot, make sure the pot has holes on the bottom so that water can drain through. You don’t want water settling around the root, as this will cause root rot. When you have placed the plant in a container and covered the roots with soil you can add a bit of mulch around it, being careful not to let the mulch come into contact with the plant itself. 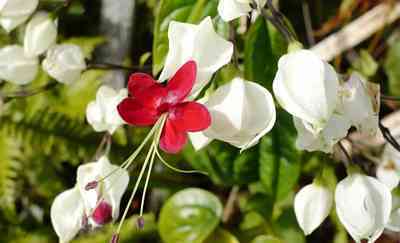 After planting the Bleeding Heart vine make sure that you water the plant well. This is important until the plant is well established. Always use lukewarm water and not cold water, as a frigid water temperature may put your plant into shock. It is also important that you never let the soil dry out, which will kill the plant. Bleeding heart likes high humidity and a moist, but not soggy, soil. You will want to feed your plant about every two weeks while growing. Use a gentle liquid fertilizer that you can add to the water. If you plant outdoors you can add slow release fertilizer to the soil. 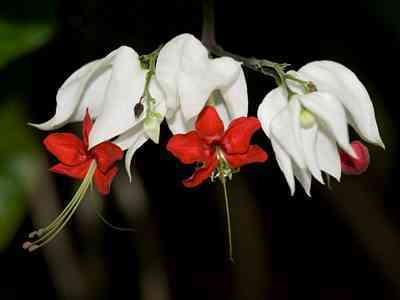 The Bleeding Heart vine will need to be pruned during the winter months for best growth during the warmer months. Prune it in mid-February just before new growth emerges. You’ll want to remove old, overcrowded shoots - particularly any that are too long for your taste. Plus, the flowers grow on new wood so don’t be afraid to cut the plant back severely. This plant is frost tender and may die back in winter. If plants are damaged by frost, burnt tips and leaves should be left on the plant until spring and then cut away to make way for vigorous new growth. 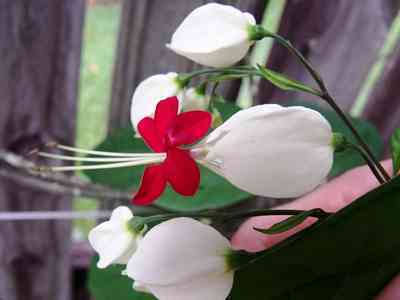 The Bleeding Heart vine is a plant that produces some great flowers for cutting. You won’t have to feel guilty about cutting flowers from this vine, as it will actually help it to become healthier and produce more flowers. You’ll enjoy the heaviest flower crop from early spring through mid-summer and then it will slow a bit into the fall. 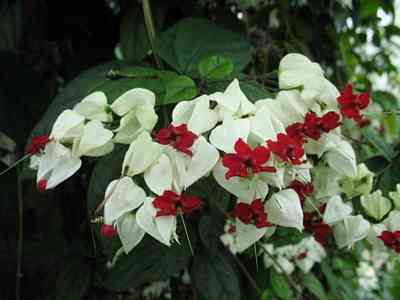 The Bleeding Heart vines are popular ornamentals, cultivated widely for their distinctive and beautiful flowers. 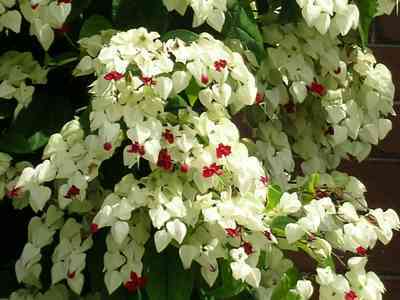 It can be kept pruned into a shrub, or given support and allowed to scramble like a vine. It does not spread as much as some, and is thus a good choice for a restricted support like a doorway arch or container trellis, and not such a good candidate to cover a fence or an arbor. 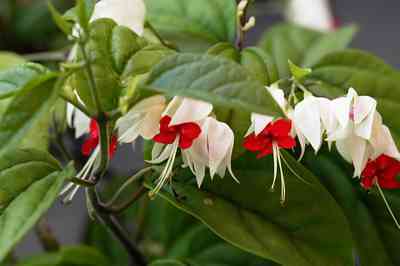 This plant is great for growing in containers, especially in hanging baskets. It also makes a fine houseplant anywhere, so if your climate is too cold, grow it indoors. In captivation - your living room, say, or your kitchen - it’s likely to stay under three feet. When properly sited and cared for, it will be full with lush foliage and branches that spill over the edge of whatever container you choose.